Revolution Slider Error: Slider with alias hero-hibernation not found. The APS Conferences for Undergraduate Women in Physics (CUWiP) are a set of regional conferences held at 12 different locations around the US and Canada. We are excited for you to join us for the 2019 CUWiP at The College of New Jersey! Our goal is to inspire, empower, and enable young scientists like you to pursue your academic and career aspirations. Students from NJ, NY, PA, DE, CT should apply to the TCNJ CUWiP. Students in Canada are encouraged to apply to the Canadian CUWiP at the University of Ottawa. We have so much planned for you! We have an exciting agenda that will enable you to engage deeply with academic and industry leaders to grow your scientific knowledge, professional connections, and personal empowerment. All scheduling is in Eastern Standard Time. Register on the APS Physics site by November 16, 2018. You may have some questions about the conference. Driving directions and suggested modes of public transportation. Information on the conference hotel, arranged for and provided by TCNJ. TCNJ’s Physics Department is recognized annually by the American Institute of Physics as one of the top producers of physics majors in the United States. TCNJ Physics also ranks 2nd nationally by number of physics teacher certifications, and it ranks among the top in the nation in the percentage of its graduates who have gone on to complete doctoral degrees, according to the National Science Foundation. This conference is supported by The College of New Jersey, the National Science Foundation (PHY-1346627), the Department of Energy (DE-SC0011076), and the American Physical Society. Further details are available on the APS conference website. TCNJ invites high school women and their teachers to join us for the Conference for Undergraduate Women in Physics. The conference will take place on Saturday, January 19, 2019 from 7:30 am to 5:00 pm at the Brower Student Center on TCNJ’s campus in Ewing, NJ. The conference will feature workshops, presentations, and activities on what it means to study physics, what a career in physics is all about, how to get involved in research early, and how to boost your college application. Separate workshops specifically tailored for high school teachers will also be offered. In this workshop, attendees will hear from experts how to decide on which college or university is right for you, and how to select a program of study. Professionals and student workers from the administrative offices will walk you through the admissions process and discuss how to boost your application packets. Do you love science but you’re not sure exactly what science career path you’d like to follow? Or do you enjoy showing other people new things and helping them learn? Consider a career in science education! This workshop will be a panel discussion with science educators, talking about work as a science teacher or informal educator. Come find out more about these career opportunities! Who says you have to wait until graduate school to do real research? You love science, and one of the best things about science is DOING IT to discover new things. This workshop is a panel discussion with students and faculty, and is focused on how high school and undergraduate students can be involved in physics research. Physics suffers from an underrepresentation of women. This workshop – led by an expert in gender issues within science – explores some of the reasons behind this problem and what we as a community can do to grow the number of women working in Physics. Can you use your physics knowledge and your wits to solve this fiendish collection of physics puzzles? Only one way to find out! Tour the TCNJ Physics department facilities and explore state-of-the-art instrumentation and equipment. Expected stops include the observatory domes with telescopes, the planetarium, the scanning electron microscope (SEM), and the atomic force microscope (AFM). Visitors are encouraged to bring a small object that they can image using the SEM! The Next Generation Science Standards are here, and it is vital for physics teachers to design curricula and pedagogy that align with NGSS. This workshop will help you better understand what NGSS is and how to be compliant with it, as well as how to use it to make sure your students are learning effectively. Laboratory experiments are a vital part of any physical science course. But many labs fail to provide students with opportunities to gain proper quantitative and data manipulation experience, and don’t allow students to learn the computational skills they need. This workshop will explore how to use computational lab activities to address these needs. It’s always nice to bring home something tangible from a workshop! In this session, attendees will learn the physics principles behind a device, and then build and test one of their very own, and then of course be able to bring it back to their classrooms for use in demonstrations or activities. Everybody loves a good physics demo! Come see a wide variety of demonstrations from many areas of physics and learn the physics principles behind them. We hope you can find one you haven’t seen before and think about how to incorporate it into your teaching! If accepted, the registration fee to attend the conference is $45. In cases of need, a fee waiver is available. Please contact us at cuwip@tcnj.edu for more information. Hotel accommodations and food will be provided by TCNJ. We expect students to receive funding for the registration fee and transportation from their respective departments. If you are unsure who to ask in your department, be sure to reach out to an academic advisor, faculty member you know, or other contacts for guidance on the process. Limited travel funds are available for students who are unable to receive travel funds from their department. The APS Conferences for Undergraduate Women in Physics (CUWiP) are three-day regional conferences for undergraduate physics majors. The 2019 conferences will be held January 18-20. The primary goal of the CUWiP conference is to help undergraduate women continue in physics by providing them with the opportunity to experience a professional conference, information about graduate school and professions in physics, and access to other women in physics of all ages with whom they can share experiences, advice, and ideas. The 2019 program at The College of New Jersey will include research talks, panel discussions about graduate school and careers in physics, workshops and discussions about women in physics, student research talks and poster session, and laboratory tours. Who is invited to attend CUWiP? Any undergraduate student with an interest in physics may apply to attend a CUWiP. For the last decade, Conferences for Undergraduate Women in Physics (CUWiP) has helped undergraduate women thrive in physics by providing them a with a unique opportunity to engage with and learn from other women in physics at all stages of their physics careers. At CUWiP, budding physicists will experience a professional conference, learn about graduate school and professions in physics, and share invaluable experiences, advice, and ideas with other women. Undergraduate students are eligible to apply and register for the conference, and we encourage non-undergraduate students or interested faculty/mentors to email cuwip@tcnj.edu for details about attendance and participation. How do you pronounce CUWiP? Who can attend? Do I need to be a physics major to apply? Any undergraduate student attending a US college/university may apply. Are applying to attend the conference that is geographically closest to their expected location January 18-20, 2019. There is no formal application or registration process for non-undergraduate students and interested faculty/mentors. We encourage you to email cuwip@tcnj.edu for details about attendance and participation. Are “application” and “registration” the same thing? No. You apply to attend a CUWiP conference (the one closest to you), and you are accepted, wait-listed or declined according to the priorities listed above. Application is free, and the deadline is Friday, October 12, 2019 at midnight ET. After you have been accepted, you then you register to attend the conference to which you have been accepted (you may be assigned to a different conference depending on the number of applications) to confirm that you will actually be attending. There is a one-time registration fee of $45, which helps offset some of the cost of the conference, including all lodging and meals. How do I know which site to apply to? Please apply to the site in the region that is closest to you using the APS CUWiP map as a guide. Do I need to book my travel before registering? No, but you should have an estimate of the cost. If you are traveling by air, or long distance train or bus, and your travel cost is not covered by your department, your travel agenda and cost must be approved by the conference organizers before you book your travel. Due to the limited nature of our travel funds, we ask that you find the most economical means of transportation to and from the conference. For example, reach out to others in your department and see if carpooling is an option. What will increase my chances of being accepted to the conference? First, make sure you submit your application by the deadline. Second, make sure you put some thought into why you want to attend and what you want to get out of the conference. Please answer all questions on the application fully and honestly. Offering to present a talk or a poster will not affect your chances of being selected to attend. Students who are accepted to attend the conference must pay a one-time registration fee of $45, which helps offset some of the cost of the conference, including all lodging and meals. If you cannot afford the registration fee and your department/college is unable to help, you may request a fee waiver by submitting a statement attesting to your financial need and verifying that department or university funds are not available. Further details will be provided when you are invited to register for the conference. You must request a fee waiver at least two days in advance of registering. Lodging (for non-local students) and food will be covered by the conference; you do not need to pay for your hotel room or food at the conference. We expect that your travel expenses will be covered by your home department or college. However, if they are not able to cover these expenses, travel funding is available. Please contact us at cuwip@tcnj.edu for more information. How do I know the amount my department will contribute to my travel funding? Please talk to your department chair, manager, or director of undergraduate studies before registering for CUWiP. You might ask an academic advisor, faculty member you know, or other mentor for guidance about who to ask if you are unsure. You can also contact us if you would like guidance in asking your department for travel funds. Do I need to have research to present in order to attend the conference? No. While we encourage you to present a talk or a poster if you have been involved in research, you are welcome just to attend the conference and participate in the activities. I attended last year; can I come to this year’s conference, too? The content of this year’s conference will not be exactly the same as last year’s, and you are welcome to apply to attend again. However, if more students apply than we can accommodate, preference will be given to students who have never attended a CUWiP. I am a local student. Do I need to register? Yes, all attendees must register by the deadline. Can I attend the TCNJ CUWiP even though it is not my closest location? Because of the high demand of students and travel costs of those who are not in our region, we will only be able to accept students who will be in the region at the time of the conference. This conference is not intended to be a graduate school visit. I’m a student from Canada. Can I apply to a U.S. site? Students from Canada are encouraged to apply to the Canadian site at University of Ottawa. Students from Canada may apply to closer U.S. sites if desired. However, Canadian students accepted to U.S. sites are not eligible for reimbursement of travel expenses from the conference or for waiver of the registration fee. I’m a student in a country other than the United States or Canada. Can I apply for CUWiP? APS is only able to fund students attending universities in the U.S. We welcome students attending non-U.S. institutions to email our site at cuwip@tcnj.edu or another CUWiP site to ask if you can apply to attend. CUWiP sites will not be able to reimburse students attending non-U.S. institutions for accomodations or travel. I’m a community college student. Am I eligible to apply to CUWiP? Yes, undergraduate students at any U.S. college or university may apply. I’m a high school student/grad student/postdoc/faculty member. Am I eligible to apply to CUWiP? Only undergraduate students who will be over 18 at the time of the conference may apply to CUWiP. If you would like to attend, please contact us at cuwip@tcnj.edu. I am transgender/gender-fluid/genderqueer/non-binary etc, can I attend this conference? Yes, students of all genders are welcome to attend this conference. If you have questions or concerns about the housing for this conference, please contact us at cuwip@tcnj.edu. How do I arrange travel? Students are responsible for arranging their own travel to the conference. We encourage students to coordinate with other attendees from their institution. Please be in communication with your local chair or faculty member if your department is reimbursing you for travel costs. If your department cannot fund your travel, please contact cuwip@tcnj.edu for plane and train ticket approval before purchase. Can I come late? Can I leave early? Can I skip things that I’m not interested in? Because your travel costs are reimbursable, it is expected that you will attend all of the conference events as scheduled. If you have special circumstances, please contact us to discuss them. Where do I stay during the conference? Students will be accommodated at Spring Hill Suites in Ewing, NJ. Please visit our Travel & Accommodation page for more information. Do not make your own hotel reservations. You will be assigned a roommate. Depending on the number of participants, some may be assigned a rollaway bed. Please contact us at cuwip@tcnj.edu with any concerns related to accommodation. How can I get to and from the airport? We will help you with travel between airports and TCNJ, by organizing shuttles, or pointing you to commercial services. If you plan to fly, please contact us before making your reservation. Please visit our Travel & Accommodation page for more information. When will I get reimbursed for travel? If you are being reimbursed by the conference (rather than by your department): after the conference, you can submit the reimbursement form that will be provided to you. Reimbursement will be mailed to you within the month. For more details please contact us. We will request dietary restriction information on the registration form. If you believe your dietary needs are unusual, please contact us and we will work to accommodate you. The conference has no dress code, and we encourage students to be comfortable. CUWiP is a professional conference for which you want to look suitably presentable. The schedule is very full and you will not have time to change throughout the day, so we suggest comfortable attire that is not overly formal. Comfortable walking shoes and winter attire are most appropriate as there will be travel to different buildings on campus. You may wish to look at photos of previous conferences to see what students typically wear. Will there be resources available for attendees with disabilities? We will request information on disability status on the registration form. Please contact us in advance if you have unusual requirements, and we will work to accommodate you. What are the guidelines for posters and talks? Information on the Presentation Guidelines will be emailed to participants. Can I connect with those going to the conference before arriving ? Yes! We have set up a Facebook page for the conference. https://www.facebook.com/CUWiPTCNJ/. I have anxiety, depression, etc, and I am worried about attending this conference. What should I do? Please contact us at cuwip@tcnj.edu if you are comfortable so we are aware. We will encourage you to try your best during the networking opportunities, but if you need to be paired up with someone you know (either in rooming or meals), please let us know so we can try to accommodate you. We hope that you will be able to comfortably attend the conference and get something from it, but we understand that everyone needs to go at their own pace. What if I need child care? – They, them, theirs (Xena ate their food because they were hungry.) This is is a pretty common gender-neutral pronoun…. And yes, it can in fact be used in the singular. Ze is pronounced like “zee” can also be spelled zie or xe, and replaces she/he/they. Hir is pronounced like “here” and replaces her/hers/him/his/they/theirs. – Just my name please! (Xena ate Xena’s food because Xena was hungry) Some people prefer not to use pronouns at all, using their name as a pronoun instead. – Never, ever refer to a person as “it” or “he-she” (unless they specifically ask you to.) These are often used as offensive slurs. Based on the information here and resources linked therein. Why does TCNJ CUWiP ask for my preferred pronouns? Why should I consider putting them on my name badge? CUWiP seeks to be a safe space for all participants. By asking for preferred pronouns, we are ensuring that we don’t accidentally misgender any of our participants or make harmful assumptions based off of appearance. Even if you have never considered this in relation to yourself, by including your preferred pronouns on your name badge you can help to make other CUWiP participants comfortable. We hope you will consider this. We encourage local participants to travel to Ewing by car or train. For longer distance travel, be sure to contact us as well as your department to approve your flight or train fare before making a reservation. View detailed directions to TCNJ via car, train, and air. If you are driving to campus, please park in Lot 3. 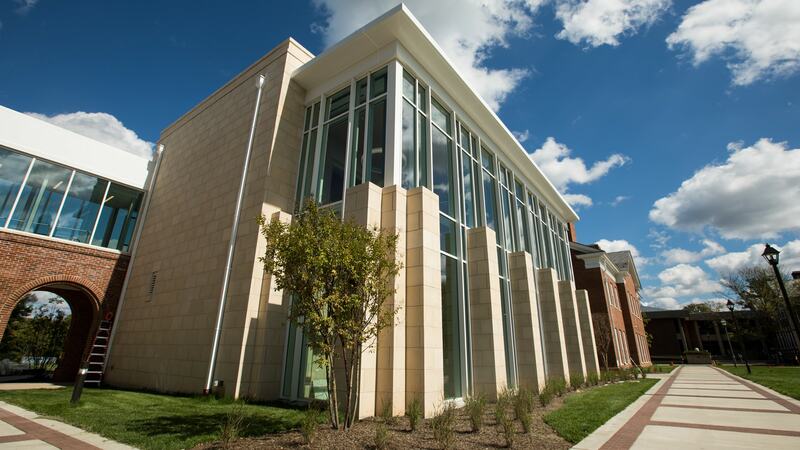 The conference will be held at the Brower Student Center on TCNJ’s campus in Ewing, NJ. Participants will be lodged at Spring Hill Suites in Ewing, NJ. Shuttle buses will transport students between the hotel and conference events.